In the run-up to the NATO summit in Warsaw in early July, the Western military alliance is building up its military might in Eastern Europe, heightening the danger of a nuclear conflict with Russia. On Tuesday, the new NATO rapid intervention force, the Very High Readiness Joint Task Force (VJTF), began manoeuvres in Poland. As part of the “Brilliant Jump” exercise that will last till May 27, 1,500 soldiers from the VJTF land component, including the Spanish brigade BRILAT as the core of the VJTF, are practicing a rapid deployment to Eastern Europe. The VJTF is aimed directly against Russia. Its establishment had been decided at the NATO summit that took place in Wales after the pro-Western coup in Ukraine in September, 2014. The VJTF belongs to the NATO Response Force (NRF), the rapid reaction force of NATO, whose troop strength in February last year was doubled to 30,000 soldiers. In an emergency, the 5,000-strong “spearhead” of the NRF can be operational within 48 hours. “Brilliant Jump” is just one of many NATO exercises that are currently taking place in Eastern Europe. The manoeuvre “Spring Storm” in Estonia, which runs until May 20, will be held in close proximity to the Russian border. According to a press release of Germany’s Federal Armed Forces Association, “around 6,000 soldiers from several countries,” including “professional and volunteer Estonian troops, conscripts and reservists” and “units of eight NATO countries and Finland” are participating. From Germany, “a company of the Bundeswehr [Armed Forces]” is taking part. From June 7 to 17, one of the largest exercises will take place this year in Poland, with the “Anaconda” manoeuvres. 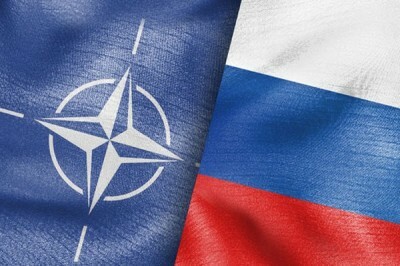 The script foresees an Article 5 scenario, with a NATO counterattack following a fictitious attack on NATO member Poland. The scale of the exercise is enormous. According to NATO officials, about 25,000 soldiers will participate in “Anaconda.” In addition, 250 armoured vehicles from the US Army will be used, including more than 90 Abrams M1 battle tanks. The Bundeswehr is increasingly taking on a leading role in this massive NATO deployment against Russia. At the end of April, after a meeting with Latvian Prime Minister Maris Kucinskis, Chancellor Angela Merkel confirmed government plans to move German troops to Lithuania. “Some reinforcements are possible here, we will also consider these at the moment,” said Merkel. Specifically, the Bundeswehr could take the lead in building a NATO battalion in Lithuania. As well as the manoeuvres already mentioned, the following are also taking place: “Persistent Presence,” a continuous presence of German units of company strength in the Baltic countries and in Poland from April to June; “Baltops,” a naval exercise in the Baltic; “Iron Wolf,” a defensive and offensive exercise by multinational fighting units in Lithuania in June; “Sea Breeze,” from July 11 to 21 in the Black Sea; and “Flaming Thunder,” an artillery exercise using live ammunition from August 1 to 12 in Lithuania. In the autumn, there follows the engineers’ exercise “Detonator” in Latvia, and the full force exercise “Silver Arrow” (also in Latvia), “Borsuk (Poland), and “Iron Sword (Lithuania), in which a German tank company and sections of a motorised artillery battalion will participate with Howitzers. Germany is also involved in the military upgrading and rearmament of the Baltic states, whose extreme right-wing and anti-Russian governments are playing a key role in the NATO aggression against Moscow. For example, the German government will provide Lithuania with twelve self-propelled armoured Howitzers from the Bundeswehr. This was announced by Defence Minister Ursula von der Leyen on April 15 as part of her visit to the Lithuanian capital Vilnius. Lithuania should also receive weapons fire control systems and the means for artillery observation. In addition, the Lithuanian army has expressed an interest in the Boxer armoured transport vehicle. Von der Leyen also promised her support in this matter. She will “work to ensure that Lithuania receives a slot in the OCCAR.” OCCAR (Organisation de Coopération en Matière d’Conjointe Armament), is the joint organization of the Boxer beneficiary states. The permanent presence of Western troops in Eastern Europe, and the massive rearmament of the Baltic states are not routine exercises. NATO is putting into practice war plans that its military and geostrategists have elaborated behind the backs of the population. The authors are the former leader of US forces in Europe (SACEUR) and Commander of NATO forces in the Kosovo war, Wesley Clark, the former commander of the Allied Joined Force Command of NATO, Egon Ramm, the former director of the International Centre for Defence and Security, Jüri Luik and the former NATO Deputy Supreme Allied Commander Europe (DSACEUR), General Sir Richard Shirreff. The detailed paper recalls the war plans that the generals of the imperialist powers designed before the First World War. As a particular challenge, Clark and Ramm identify the closure of the “Suwalki-gap,” the narrow land bridge between Poland and Lithuania, close to the Polish border town of Suwalki. According to Clark and Ramm, in an emergency, the VJTF is neither fast nor large enough to rush to the aid of the enclosed Baltic states over this bottleneck. They therefore argue for an “effective deterrence strategy” that includes not just another upgrade of conventional forces in the East, but also a “reinforcement” in the field of nuclear weapons and cyber defence. In the case of the German General Ramm, this blatant threat of a new “total war” leaves a particularly nasty aftertaste. June 22, marks the 75th anniversary of the German invasion of the Soviet Union, in which up to 40 million Soviet citizens were killed. Ramm’s father, Egon Wilhelm Ramm, who later was a Free Democratic Party parliamentary deputy in post-war West Germany, was a direct beneficiary of the terrible foray conducted by German imperialism. In 1941, he participated in the territories occupied by the Wehrmacht (Nazi Army) in Poland in establishing German shipping companies on the Vistula. From 1939 to 1940, and from 1942 to 1945, he fought as a soldier in World War II.